June 18, 2009, British Airways, as a "fight for survival", chief executive Willie Walsh has informed 40,000 company employees that layoffs are in the future and to prevent mass layoffs the company is requesting employees work at a reduced rate of pay of up to one month spread over a three to six months period. Non critical employees were also informed that the company would also allow employees to take up to a month in unpaid leave. More than 1,000 of British Airway's 40,000 employees have already signed up for the one month unpaid leave program or have changed their employment status from fulltime to part-time. "Our survival depends on everyone contributing to changes that permanently remove cost from every part of the business, and I would urge you to play your part," Mr. Walsh and key members of management will forgo pay for the month of July. "These are the toughest trading conditions we have ever seen and there simply are no green shoots in our industry... This is not a temporary problem. This is our greatest ever challenge." British Airways has had long-running talks with three different trade unions – Unite, the GMB and BALPA. British Airways has set a deadline of the end of June to agree with its cost-cutting plans, which include reducing cabin crew staff by 2,000 but also affect ground staff, engineers and pilots. 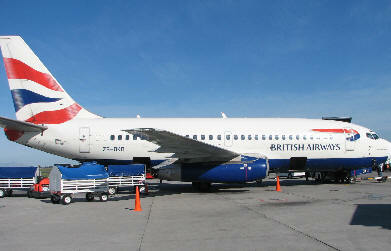 British Airline Pilots' Association (BALPA) is in ongoing negotiations with British Airways. “BALPA recognizes the difficult trading environment faced by British Airline and agrees the need for a package of changes to help the company through the downturn and enable it to come out the other end as the world leader it can be. Detailed discussions continue and the outcome will be discussed by BALPA's leadership team on Thursday and will subsequently be put to membership ballot. The aim is to conclude a far reaching agreement by the end of the month. These are unusual times and they require unorthodox approaches. Pilots recognize this and we trust that it is recognized across the whole airline” said Jim McAuslan, General Secretary of the British Airline Pilots' Association. British Airways has reported its passengers were down by 5.3 percent over 2008 numbers, passenger revenue was down 6.5 percent and its cargo revenue was down 9.5 percent. British Airways had layoffs of over 2,500 employees by mid summer 2008. At present the airline is looking at reducing the number of crew per flight in its overseas flight.